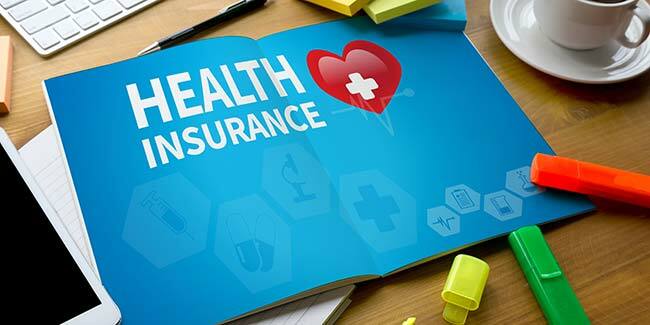 Why relying on a corporate health insurance is not a good idea? Your comprehensive corporate or group medical insurance provides many benefits. Corporate Health Policies are not very flexible. Group medical insurances are not flexible. Your comprehensive corporate or group medical insurance provides many benefits, but the coverage is dependent on and limited by many conditions. Corporate Health Policies are standard products with general features and are not very flexible to include individual needs. If you are seeking then group medical insurance may not work for you. Jagan is an employee working with a private firm in Delhi. He is a happy employee and has an insurance coverage of Rs. 2 lakhs from the employer. His insurance cover includes expenses for his parents too. He is paying a nominal fee (as his premium) deducted from his salary every time. He decides to get married. Now he has a new family member, who is not covered under his corporate health insurance policy. So, to avail the same amount of coverage he will pay additional premium. Also, Mr. X will want to increase the benefits as he grows his family. However, better option for Jagan would be to buy a separate health insurance policy. This way he can not only cover his wife, but also any children later. He can also avail tax exemption on the premium paid for the policy all the while, something which he cannot do for the fee paid for corporate health cover. 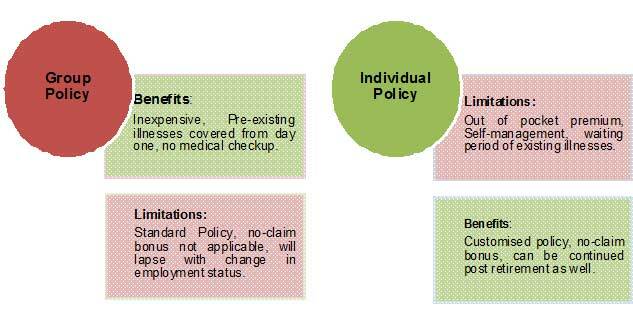 Why will you need an individual health care insurance policy still? A. Buy policy on your terms: You have complete freedom to purchase a policy and continue it at your will. You can take a family cover, which will include all your immediate family members (parents, spouse, and dependent children). B. No claim bonus:Only individual and family floater policyholders are entitled to a no-claim bonus. If you have not made any claim, you will be given a discount on your renewal premium or additional cover as a bonus. Mr. Y makes a claim for his wife’s pregnancy hospital expense. Mr. X makes no claim, during the same period. Mr. X is not entitled to no claim benefit at the time of renewal of the policy. Mr. X does not make a claim, during the year. Mr. X is entitled to no claim benefit at the time of renewal of the policy. He will pay discounted premium. C. While You are Employed and Afterwards: You will enjoy the benefits of corporate cover only til the time you are employed. If you wish to continue your policy, after leaving your company, the conversion cost can be considerably high. Also, post-retirement it will be difficult and very expensive to get an adequate cover, which is why insurers advise health care insurance at an early stage. Mr. X quits his present company to start his own venture. He is happy with his corporate health insurance cover and wants to continue it. His conversion to an individual policyholder is subject to the standard underwriting process, waiting period of 30 days, medical check-up, and high premium cost. There is no interruption in the existing policy cover. Also, the policyholder may be entitled to retirement benefits, like additional coverage if suffering from critical illness at a later stage in life. D. Restore Benefit:Some insurers offer restoration feature on family floater and individual policies, where your sum assured is restored if it is exhausted under a claim. This benefit is especially useful for family floater plans where multiple people share the sum assured of the policy. There is no need to pay additional premium in the same year to avail the benefit.